Nestled in the hills above Malibu is Saddle Peak Lodge. Throughout its 100+ year history the building has lived many lives including pony express stop, summer camp, general store, roadhouse for the stars, and perhaps even a bordello. In 1985 the lodge underwent a major remodel into its current incarnation and since 1992 has been owned by Ann Graham Ehringer. Built along the lines of a hunting lodge the restaurant has some of the toughest lighting conditions of any restaurant in LA. 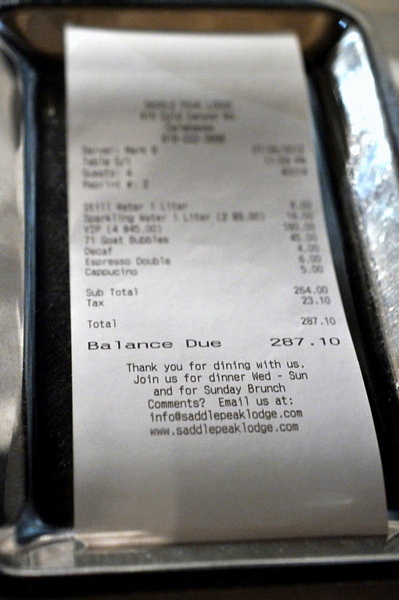 I first heard about the lodge when I was getting into fine dining but it wasn't until 2009 that I made my first visit. At the time Adam Horton had just taken over as Executive Chef and was unveiling his revised menu. With Horton's departure from the lodge in early 2011, his former chef de cuisine, Chrisopher Kufek, has stepped up to the top spot. A former carpenter, Kufek got his start washing dishes at the Cafe Buenos Aires in Santa Barbara followed by stints at Maggiano's and El Bizcocho before arriving at SPL. Like Adam before him, Chris invited KevinEats to sample his new menu and I was fortunate enough to tag along. The cocktails were more progressive than I remember from my previous visit. 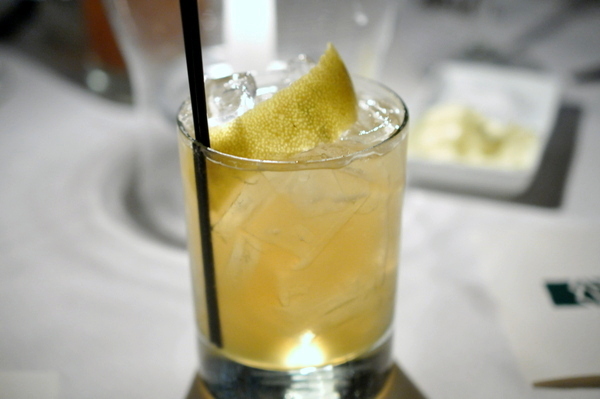 The Honey Badger was my favorite of the three, opening with an approachable citrus tang that sheathed a steely whiskey burn softened by floral notes of lavender. 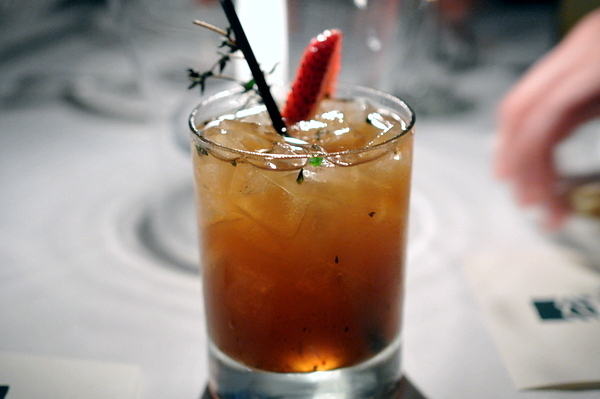 The About Figgin' Time was much sweeter with alternating notes of fruit and gin with an underlying piquant savor. 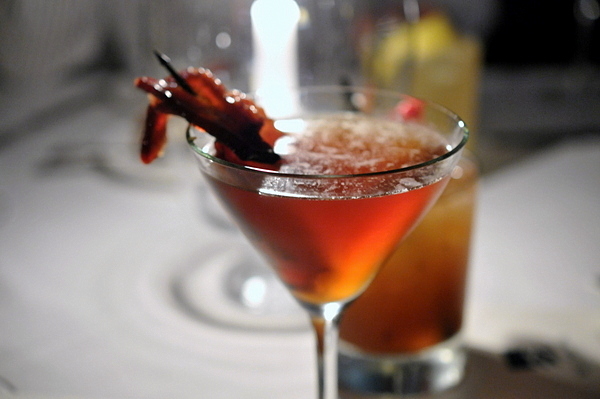 The Pig Apple was the harshest of the three with smoke, savor and a prickling alcoholic burn. The tomato and burrata were an appropriate start to the meal. The lighter flavors compliment each other beautifully while the pumpernickel provided structure as well as a nutty weight that was key to completing the morsel. 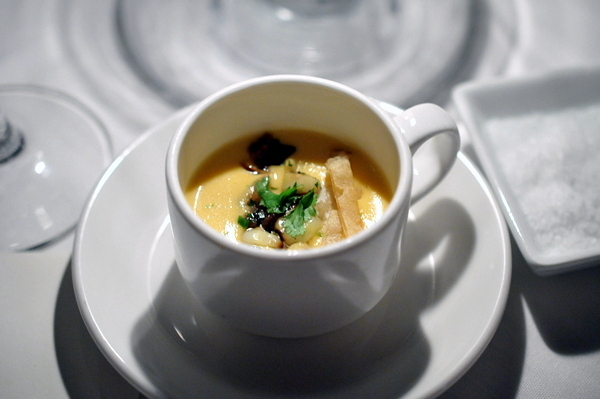 This tiny demitasse cup of thick corn soup was one of the most complex bites of the night. The warm creamy soup conveys a forceful sweetness that contrasts beautifully with the cool crisp savor of the remainder of the dish. 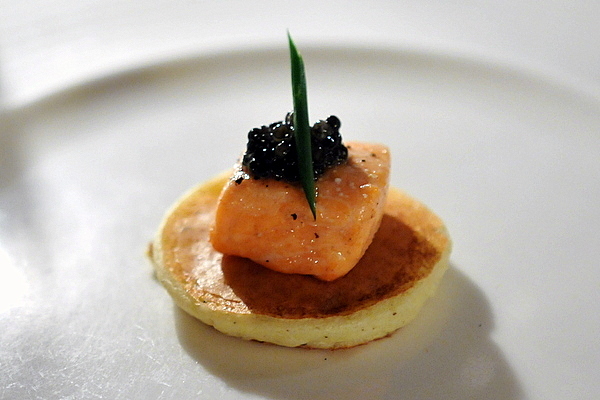 Our final canape of the night featured classic pairings of salmon and caviar. The gently poached salmon was meltingly tender but the flavor was lighter than the more commonly used smoked salmon, which would have stood up better to the flavor of the caviar. 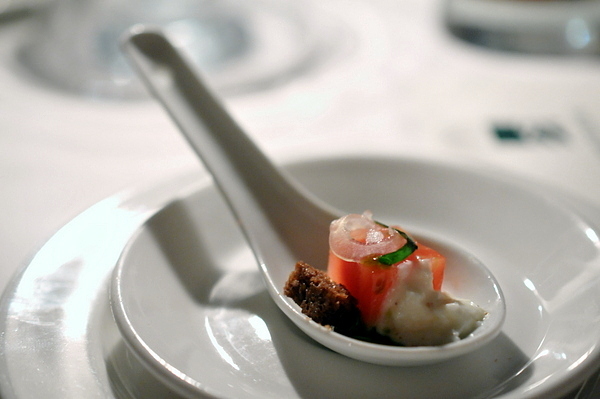 The tasting menu proper began with a twist of champagne and caviar. 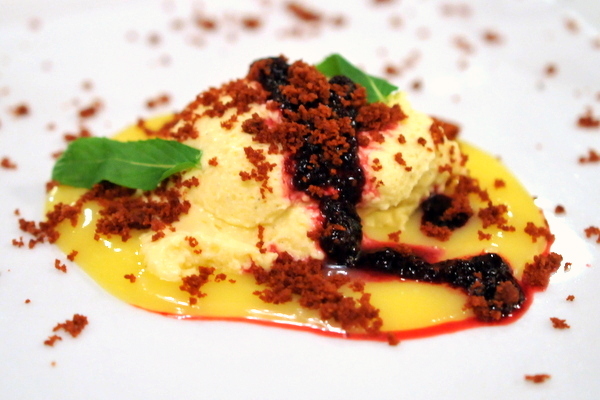 The lemon foam adds a potent fruitiness as well as restoring a fitting level of effervescence. 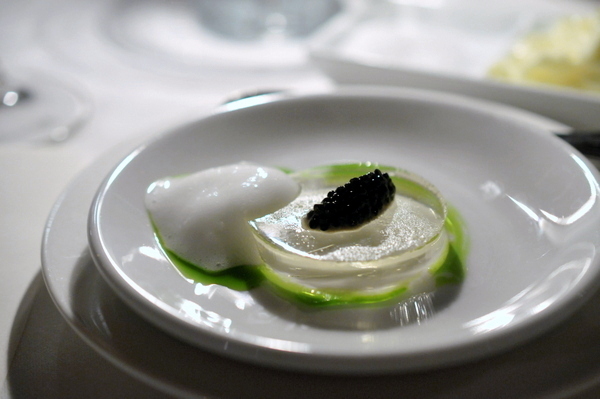 As with the previous course the caviar provides the vast majority of the savor, but with such delicate accompaniments it was more than up to the task. 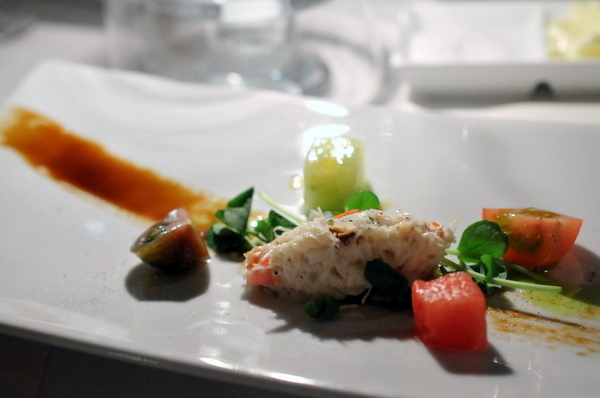 Our server described this as a deconstructed crab gazpacho. Though I don't think the components quite captured all the nuances of a gazpacho, I did enjoy the delicate flavors in the dish, particularly the incisive zest of the pea shoots. 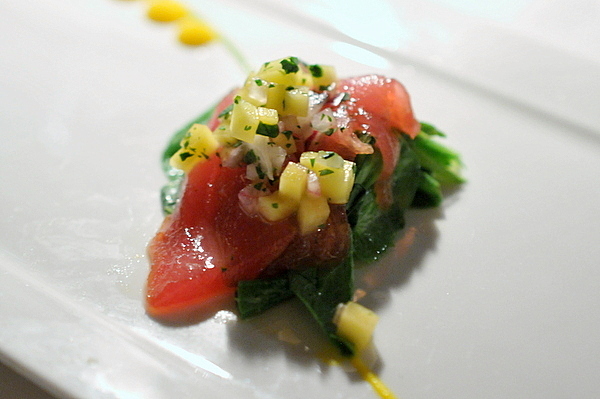 Sashimi courses always start with the fish and the fresh fleshy Albacore with its mild flavor lent itself well to the tropical sweetness of the papaya salsa. 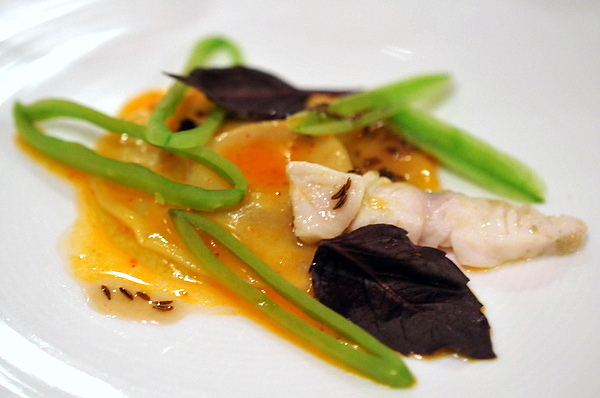 The orange ginger sauce cut through the sweetness with a bracing tang and the pea tendrils again provided a bitter vegetal balance. This was the weakest course of the night for me. The delicate flavor of the rabbit was no match for the bacon and the mushroom filling felt muted. Nothing overtly wrong just not particularly interesting. 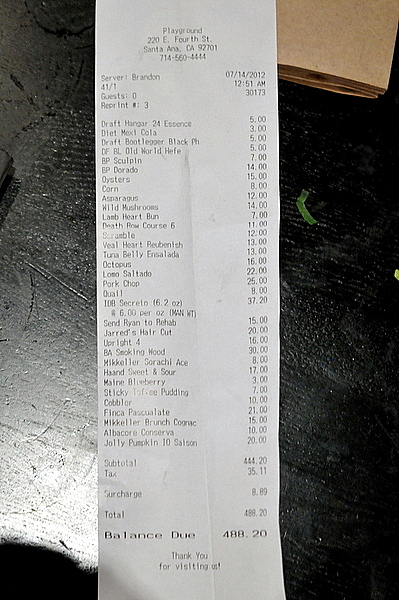 The sole was prepared table side with each person getting a half-filet. 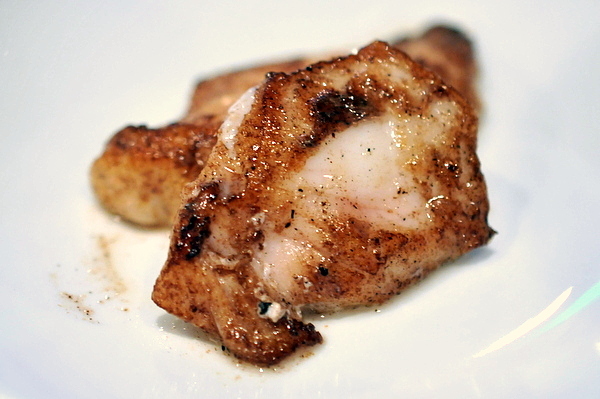 The mild tender flesh is beautifully seasoned with brown butter and capers giving the dish a savory yet piquant smack. Surprisingly it was the vegetables with the mix of textures and subtle flavors that ended up impressing me the most and the same went for the rest of the table. 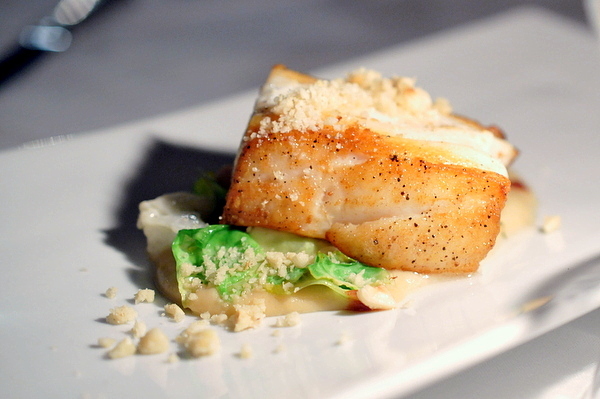 Halibut can be temperamental as evidenced by the inconsistent preparations at our table. Three of the pieces were moist and flaky but the last was dry and overdone. The seasoning was equally impressive, ripe grapes and dates with bitter Brussels sprouts both moderated by the even hazelnut and cauliflower. This was probably the strongest overall course of the night. 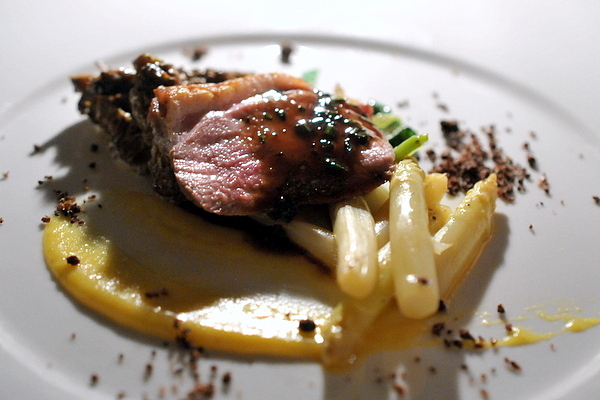 I was worried that the duck breast looked a touch overdone and indeed it was, but the flavors more than made up for it. The lightly bitter orange is a timeless match for the bird while the coffee imparts an enigmatic aura. Meanwhile, the morels and asparagus provide a combination of earth and vegetal tones that are immensely satisfying in conjunction with the smoky duck flesh. 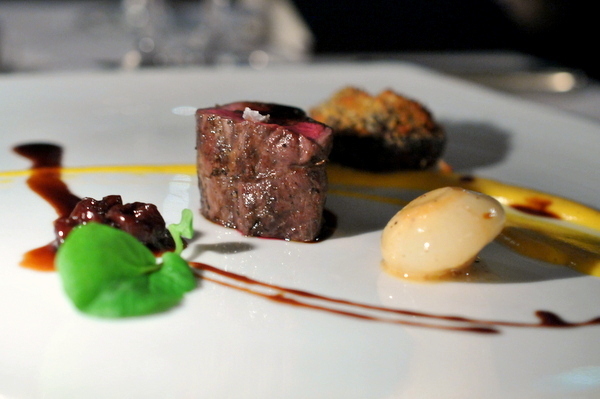 The final savory course of the night was easily the most tender piece of elk that I've ever eaten. The silky flesh had a robust iron tang that would have been disconcerting if not for the substantial moderating sweetness on the plate. A relatively innocuous cheese, the Brigante is a Sardinian sheeps milk cheese that is fairly mild and medium textured. The honey and apple provide a nice one-two punch of sweet and sour. 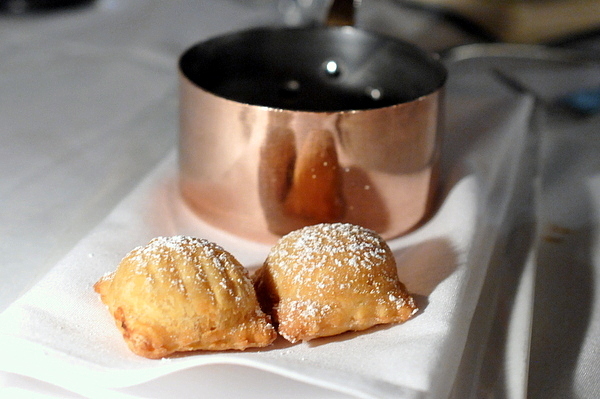 Freshly made beignets are one of my favorite desserts and this was no different. The crisp airy pastry comes stuffed with a fragrant peach filling. The caramel sauce has the best of both worlds. The boozey burn provides a moderating effect when poured over the beignets, but is sweet enough to be eaten by the spoonful. Our final course consisted of a trio of booze laced sweets. 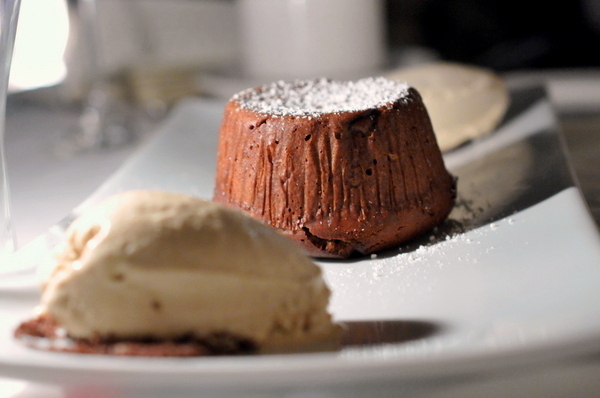 The molten chocolate cake felt a bit tired, but was tasty nonetheless. Of the troika, it was the rich flavor of the Guiness ice cream that I enjoyed most. The menu with its emphasis on classic flavors is in keeping with the restaurant's history and rustic ambiance. At the same time, Chef Kufek brings enough flourishes of creativity to keep the food from feeling tired. I left my first visit to Saddle Peak Lodge quite satisfied and I'm happy to say that not much has changed. The restaurant and movie industries are inextricably linked with plenty of people working in the former while waiting for their break in the latter. Miles Thomson the 24 year old wunderkind behind Vagrancy Project has gone against the grain; forgoing a nascent acting career to dedicate himself to cooking. In fact the former child actor refers to his interview at Nobu Los Angeles as "my last great acting job." During his time at Nobu, Miles rose to be the head line cook before teaming up with Jon Shook and Vinny Dotolo at Animal. He would remain with The Two Dudes for a number of years, rising to executive sous chef at their other restaurant, Son of a Gun. Eventually the lure of creating his own menu proved too much and in February Thompson started The Vagrancy Project, an underground supper club turned pop-up that serves as a rehearsal for his eventual permanent spot named Cottage. 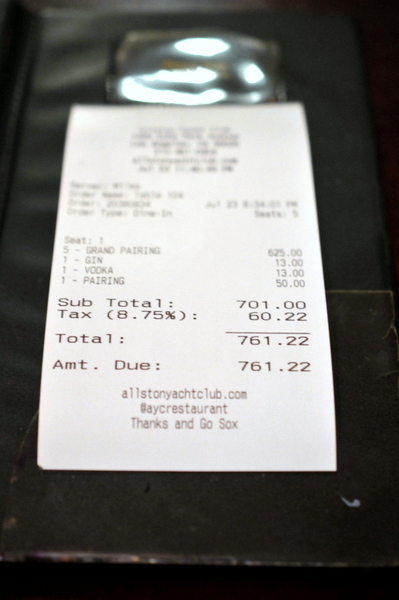 Previously run operating out of his apartment, Miles has since moved to the Allston Yacht Club where he is working every Monday and Tuesday through Labor Day. I was a bit dubious about the combination of fish with strawberries but this proved to be a remarkably complex and expressive amuse. The duo play off one another and both end up better for it with striking notes of floral sweetness intimately coupled with a healthy dose of fish oil. 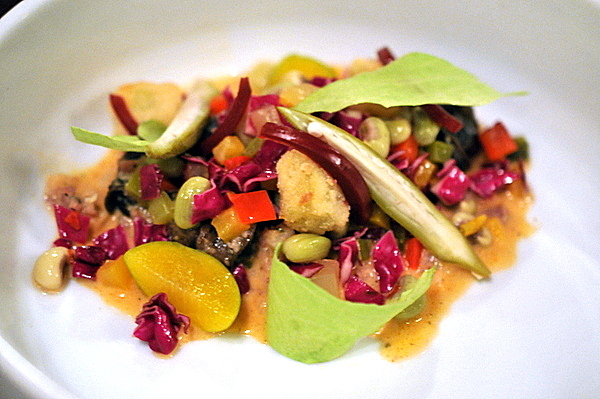 The mixture is then covered with yuzu kocho vinaigrette which adds equally bold elements of acid and spice. The Luna Oysters exude a dynamic brine that is deftly countered by the calming porcine sapor of the braised pig's feet. The kimchi-tinged geleé adds a slight pungency that helps link the duo together while the refreshing bitter notes of the radish provide relief from the bowl's heavy hitters. Chef described the next dish as a celebration of garlic with the protein playing a supporting role instead of headlining the dish. Indeed the Blade Steak serves as a sturdy platform that is battered by alternating waves of fiery spice from the garlic chili sauce and soothing verdant tones from the garlic green goddess. The meat was also topped with a sliver of meticulously seasoned lettuce that was arguably my favorite thing on the plate. Instead of the typical garlic butter soaked Burgundian preparation, these snails came smothered in country gravy and topped with a colorful mix of slaw, pickled okra, and the most amazing fried green tomatoes. The soulful warmth of the Southern flavors and melange of textures were spectacular in their own right, but it was the unconventional use of escargot that made this the strongest course of the night. I'm a sucker for both sausage and squid so putting them together is always going to win points with me. The sausage had a lovely spice set off by the characteristic game of the lamb. The squid serves as a casing for the sausage giving the meat a lovely snappy contrast and slightly briny character. 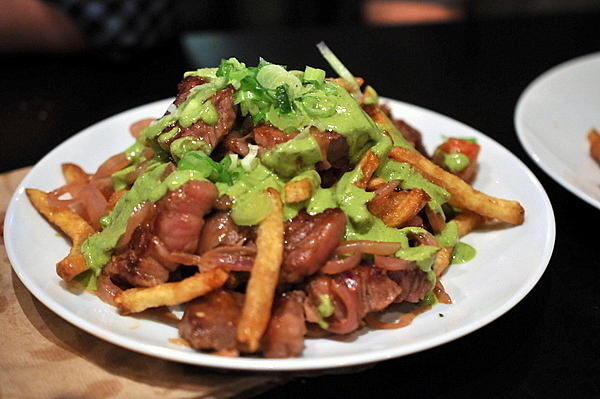 The bracing tang of the avocado cuts right through the richness of the sausage but is a bit jarring in its intensity. Next up we have a beautifully prepared scallop that had both golden brown exterior with a rare slightly translucent center that gave off delectable flavors of butter and sweet shellfish in equal abundance. The hibiscus labneh was quite intriguing, delightfully floral yet tempered by the yogurt while the Santa Rosa plums provided a resonant sugary vivacity to the shellfish. 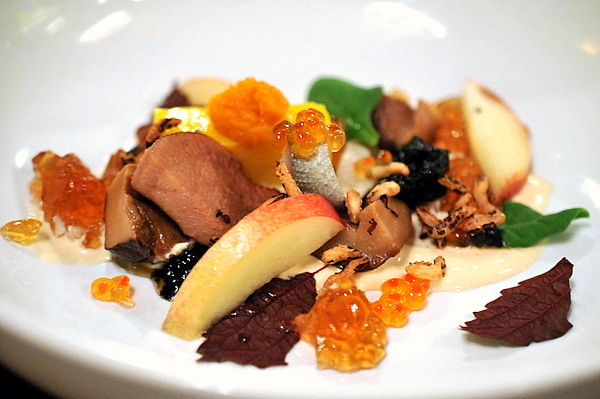 Like they did in the amuse, the fish and fruit play beautifully together. 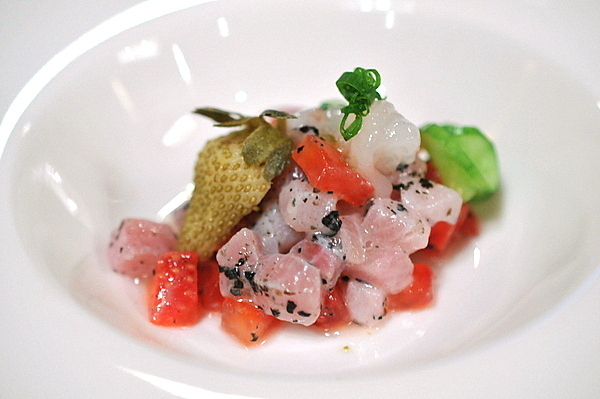 The cured Takabe, Yellow Striped Butter Fish, had a surprisingly robust flavor and firm texture that yielded ever so slightly when mixed with the sugary succulence from the watermelon. 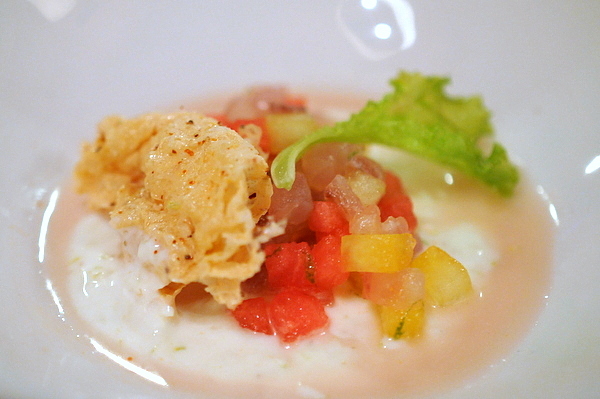 I absolutely adored the fried yuba, its peppery sapor and crunch adding a stupendous intricacy to the dish. 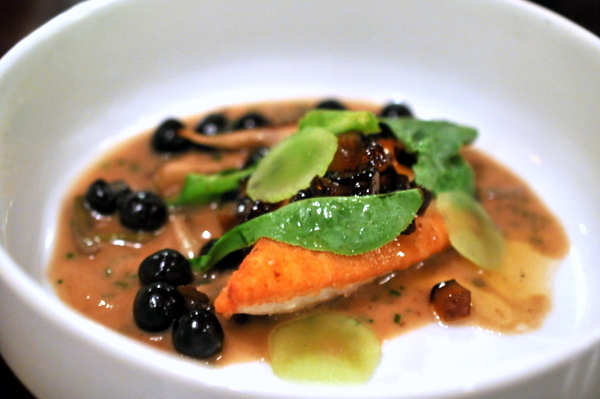 The chamomile yogurt was the only thing that didn't work for me, while the combination with the fish wasn't disconcerting per se, I just didn't care for the creamy body with the more austere texture of the fish. Starting to feel a bit full, I was afraid the duet of chorizo and pig tail would be a bit much, especially with 5 courses still to come. The chorizo on toast proved to be quite good with its rich smoky rusticity but I thought the tail easily stole the show. The tender meat and unctuous tail needed no artifice to shine, but the topping of lobster cassoulet added even more depth and complexity. The ravioli was probably the least successful dish of the night for me. 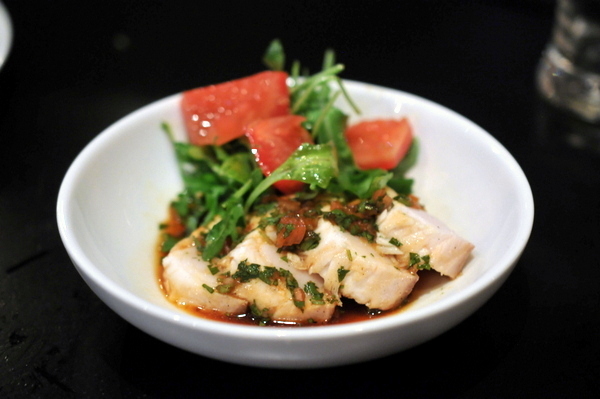 The fish, while flavorful on its own, is lost when taken as part of the dish. Likewise, I was expecting the chicken liver to be more assertive but it was the fragrance of the basil that kept standing out. I think all of us were a bit surprised to see boba resting atop the thick shiitake sauce, but the tapioca added a wonderfully playful touch to the dish. The rest of the plate was no slouch either; the dense John Dory was still flaky and moist while the sauce was bursting with an earthy butter-laden richness. Our final savory was a play on Chirashi that combined non-traditional ingredients like pickled tongue with classically Japanese elements like tamago and sashimi. Despite the sheer chaos on the plate, the ingredients work beautifully together a veritable symphony of flavors bound together by the overarching savory twang of the dashi geleé. 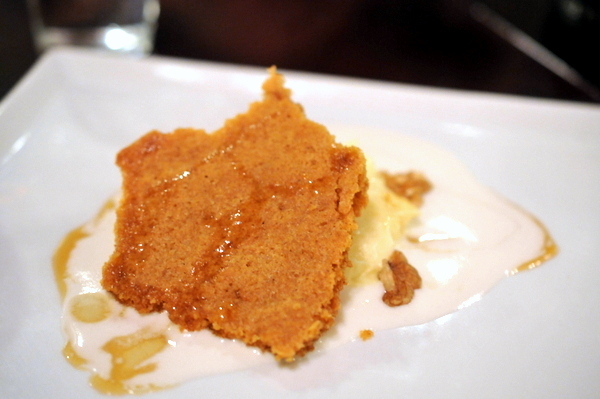 The first of two desserts was a contemporary take on cheesecake that exhibited a nice contrast between the piquant sour cream and the sweet maple syrup drizzle. It seems Miles has a penchant for a little sour with his sweets. Our final course featured a lemon curd Bavarois whose resonant acidity was just barely kept in check by the brown butter cake and fragrant Persian mint. Without a doubt, Miles Thompson is a prodigious talent and his Vagrancy Project is deserving of all the hype surrounding it. The young chef has designed a menu that belies his years; the food is undeniably creative and progressive, but it is his sense for flavors that makes him one to watch. 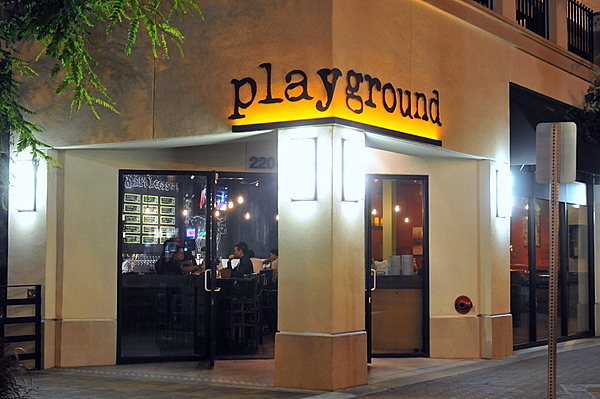 Despite having only been open for eight months, former Lime Truck co-founder Jason Quinn has made quite a name for himself at his inaugural restaurant, The Playground. After participating in and winning Season 2 of The Great Food Truck Race, Quinn sold his stake in the The Lime Truck in favor of a brick and mortar outpost. 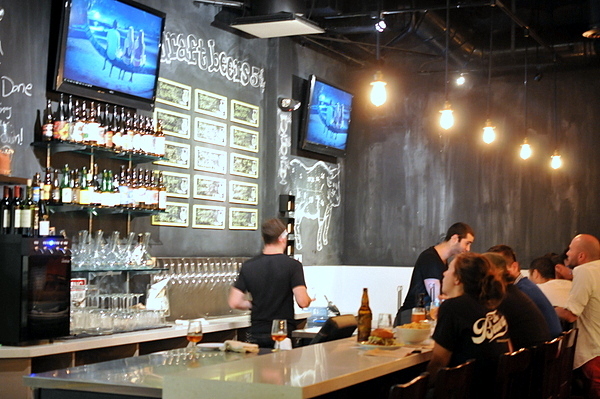 Originally envisioned as a gourmet burger joint, the restaurant has evolved to an ingredient-driven small-plates concept that also features an extensive beer lists with 120+ bottles. Hanger 24 Essence Bootlegger's Old World Hefeweizen Bootlegger's Black Phoenix (nitro) We started out with a round of draft beers. The Old World Hef was pretty prototypical with gentle sweetness and subtle hops. The Essence was a tasty double IPA that came brimming with refreshing citrus notes and a growing bitterness on the finish. The third beer was easily the most interesting the delicate nitrogen effervescence gives the beer a thick creamy feel while the flavor came with loads of coffee and a subtle tinge of smoky spice. I hadn't expected to have foie gras again so soon but apparently after consulting with his attorney father, Jason figured out a way around the ban on foie gras: give it away for free. Personally I would have been happy to buy the staff a round of beers regardless, but I wasn't about to turn down the restaurant's quid pro quo of free foie gras. 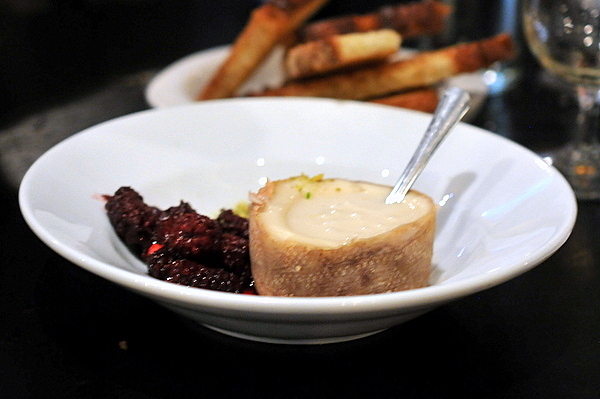 The first of three foie gras courses consisted of a torchon infused with sauternes. 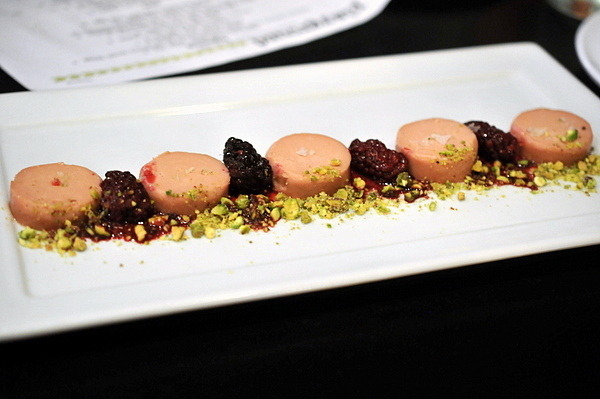 The classic pairing made even better with the application of a maple blackberry jam and the crumbled pistachios added for texture. The resulting mixture was delicious on its own or spread over thin slices of crisp buttery toast. 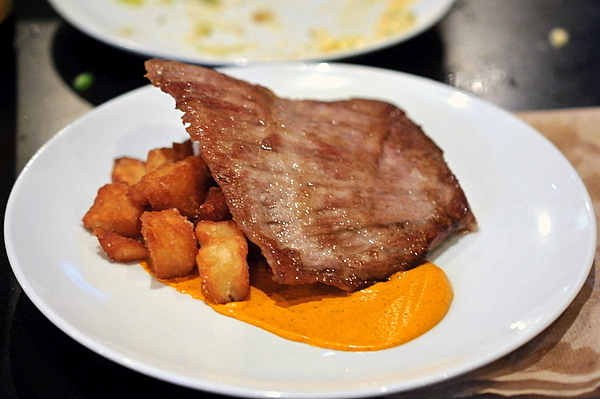 The Iberico De Bellota was an impulse buy of sorts that Chef Jason Quinn made during a foie gras supply run. 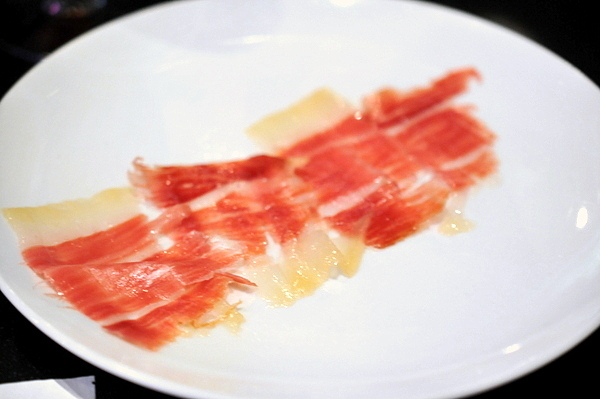 I've always loved Spanish ham, bold oily flavor with a porcine gaminess. The thin slivers that we were given left me hankering for more. A good kitchen never wastes anything, and having ordered only a single halibut there weren't enough halibut cheeks to make a menu item, but it did make a delicious gift. 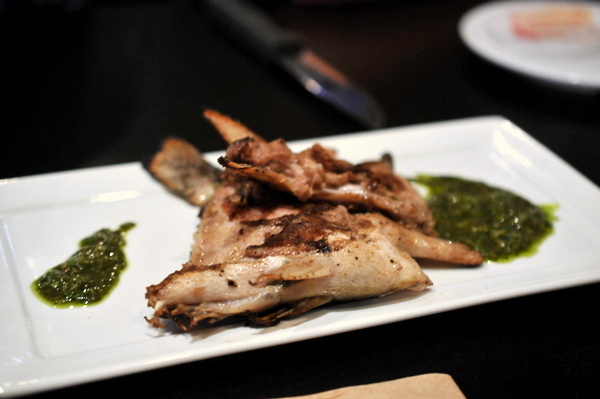 The cheeks are lightly seasoned preserving the integrity of the mild fish with an overarching essence of butter. Ballast Point Dorado Ballast Point Sculpin Our draft beers dispensed with we moved onto bottles. 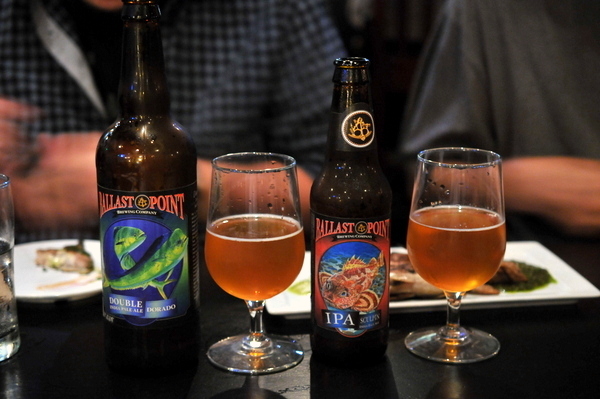 The Sculpin is one of my favorite IPAs, with bold citrus and tropical fruits and gentle but apparent pine astringency. By comparison, the Dorado is bolder and more robust, with spicy fruit and a harsher hoppy bitterness. I was glad that the staff at Playground kept this one on the menu. 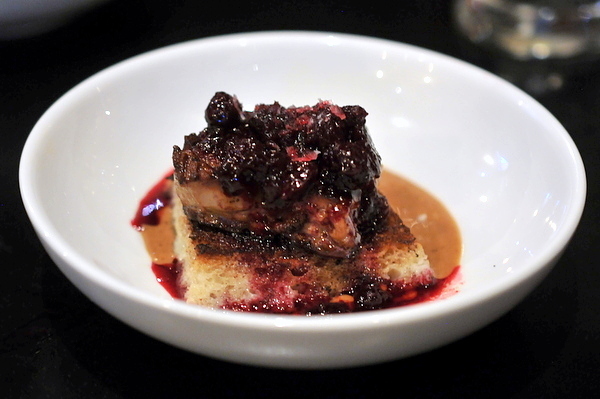 The foie gras is covered in a thin layer of bruleed sugar giving the dish a caramelized sugary attack. The vinegared rice and rock salt keep both the sweetness and foie in check. The result is a straightforward but absolutely intoxicating flavor. These Hama Hamas were some of the largest oysters that I'd ever eaten. 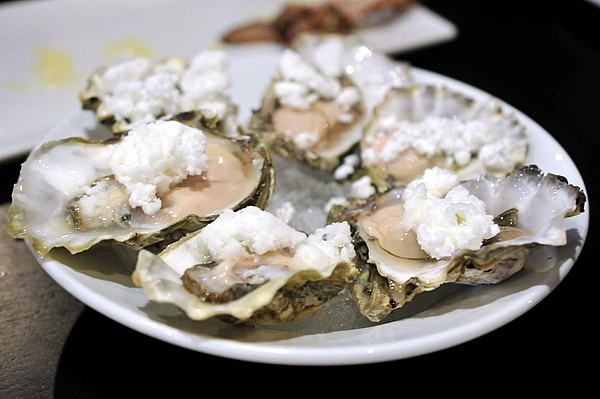 Their large size belies their gentle salinity and milky texture. The mignonette has a noticeably sweeter flavor well suited to the Hama Hamas, but would have been disconcerting on a more aggressive oyster. Mushrooms and runny egg sounds like a winning combination. 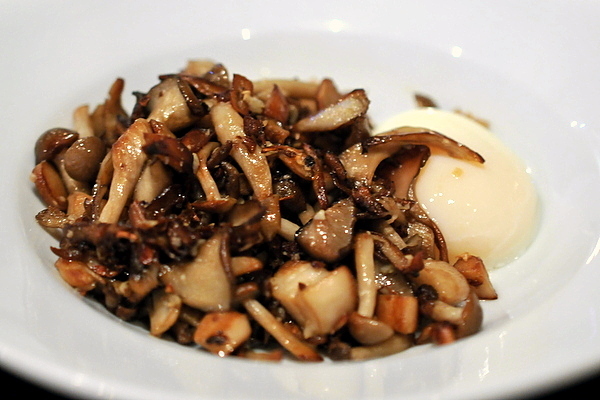 The earthy sapor of the mushrooms is complimented with an intense flavor of garlic and the sensual slickness of the egg. I had no issue with the design of the course, but unfortunately it was just too salty. 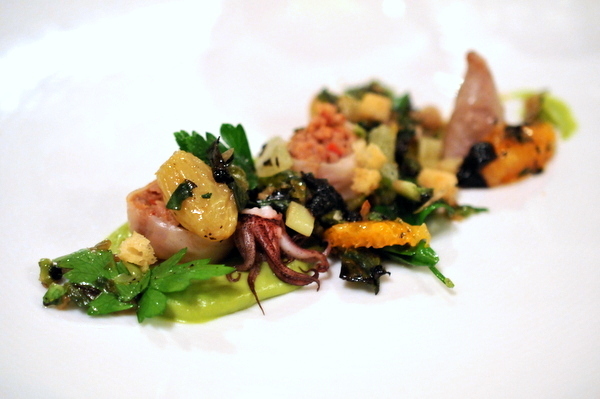 This was another contender for strongest dish of the night. 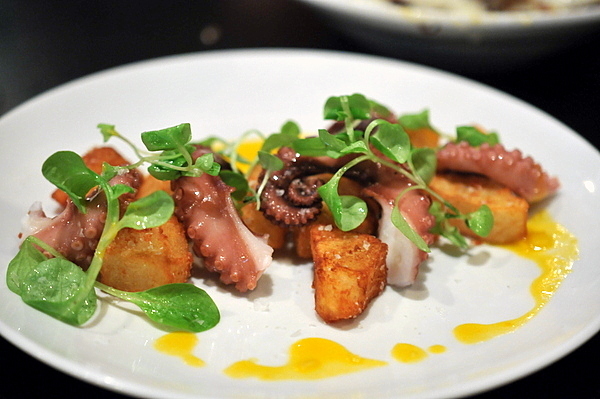 The octopus itself was dense and toothsome with a subtle salinity but it was arguably outshone by the potatoes. Based on a recipe from Heston Blumenthal, the potatoes were simply superb with a dense starchy core surrounded by a crisp sapid exterior. The mache adds a pepper vegetal accent and the entire mixture is enlivened by the bright citrus & spice of the chili paste. 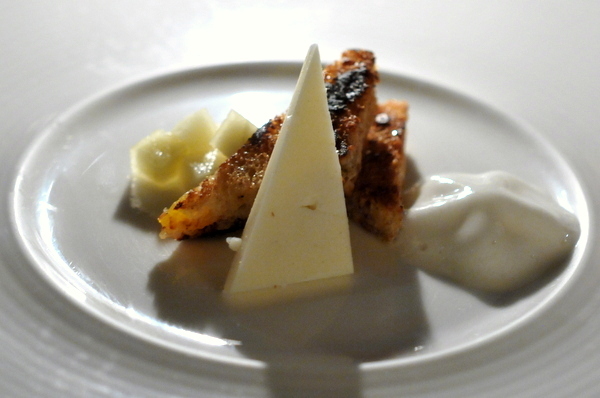 Lardo is one of those things that always sounds appealing but the flavor invariably ends up being overwhelming. Quinn shows some real finesse here, using sparing amounts of the pork fat in place of oil or butter. 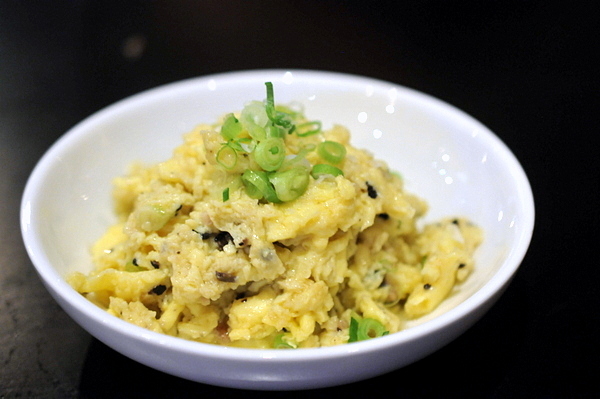 The egg is then imbued with a porcine richness while the scallion provides a countervailing freshness. 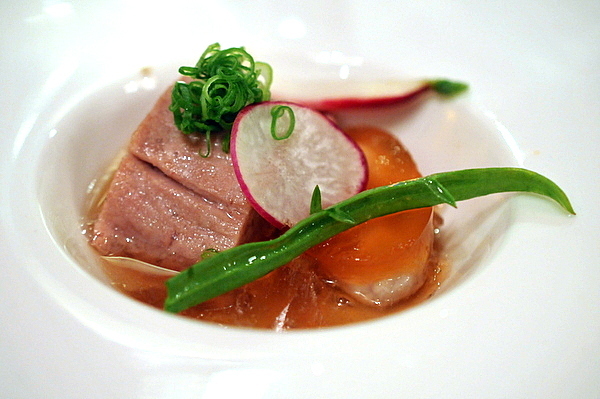 Another treasure from Quinn's trip to Vegas was a tuna belly aged for three years. 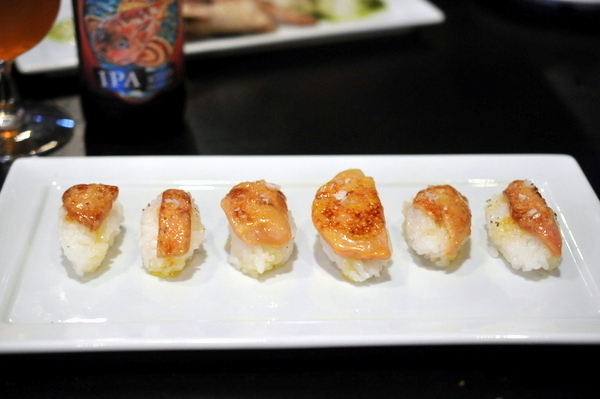 The fish itself has a rich flavor somewhere between classic tuna and a deeper meaty savor. 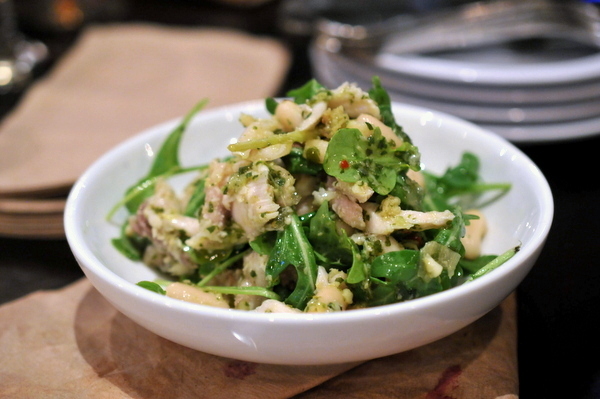 Coupled with the "Russian" salad, the mixture tasted like a classic tuna salad but with a weightier intensity. 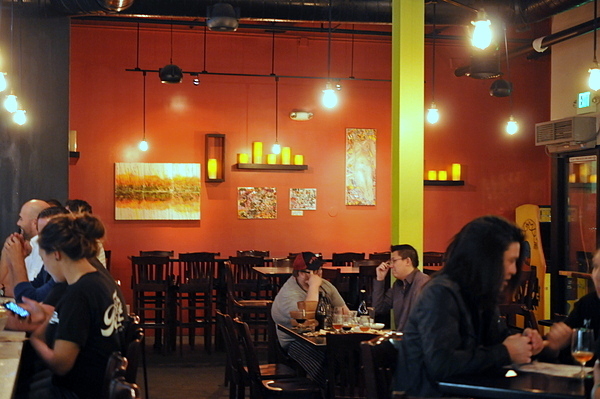 Unlike most restaurants, Quinn doesn't maintain dictatorial control over the menu. One idea he came up with was letting his crew each come up with 10 courses that they would eat for a last meal. 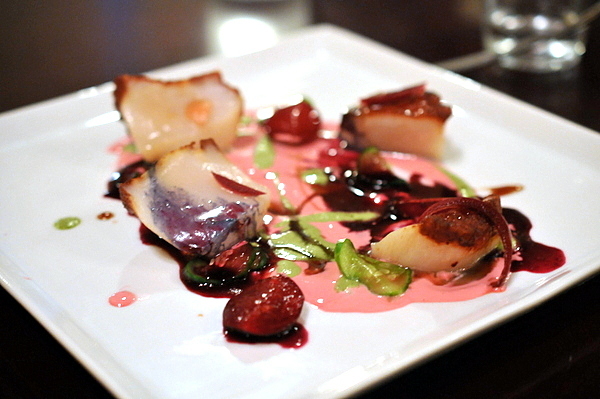 For his sixth dish, Frank Deloach opted for a butterfish tataki. The preparation demonstrated the best traits of both cooked and raw preparations of the fish while the sauce gives the dish a distinctly Japanese flavor. We debated a long while before deciding to skip this course, but I was certainly glad the kitchen corrected that oversight. 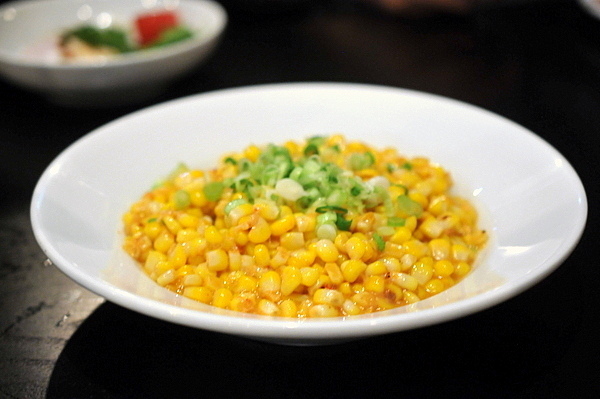 The fresh corn is immensely sweet. The sweet spicy accents are the model compliments, while the Oaxacan cheese provides a savory twang that makes this arguably the best corn that I've ever eaten. 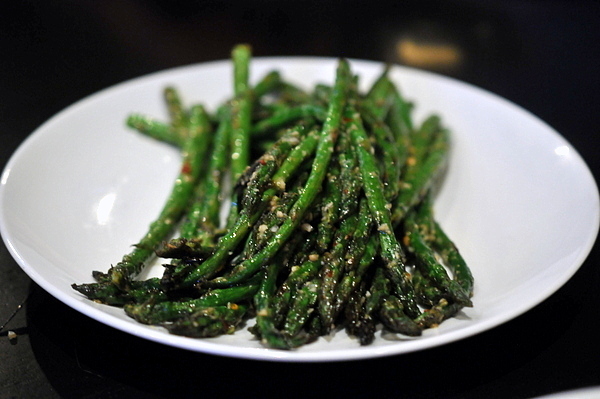 The tender baby asparagus was roasted over high heat giving it a vibrant vegetal char. A palpable heat and the heady aroma of garlic accompany the delicate sprigs providing depth and character but leaving the asparagus as the star. 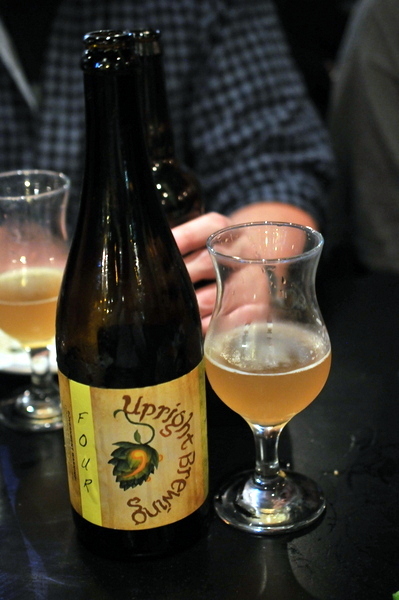 Upright Four With Saison, I always think funky and complex but this was surprisingly light. There are notes of grass a tinge of flowers and a wild effervescence that makes this wonderfully refreshing. 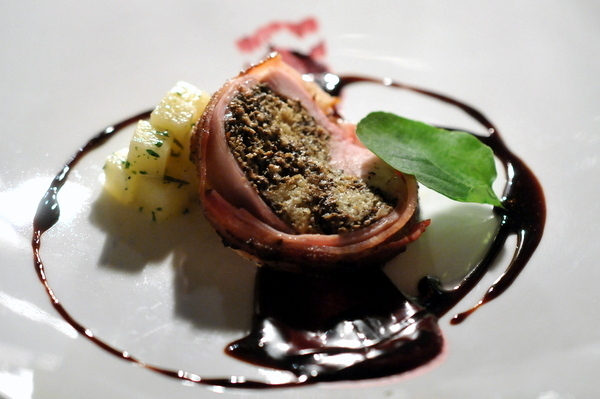 The quail signaled a shift to a heavier phase of the meal. 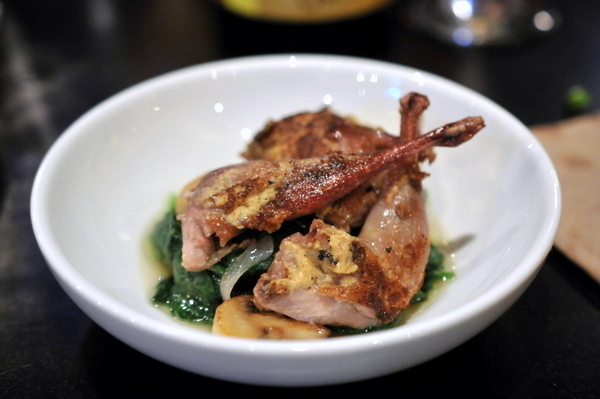 The bird was tender and flavorful quite nice with the mustard and spinach if a touch salty. I was expecting more of a Reuben-esque dish rather than an actual reuben. 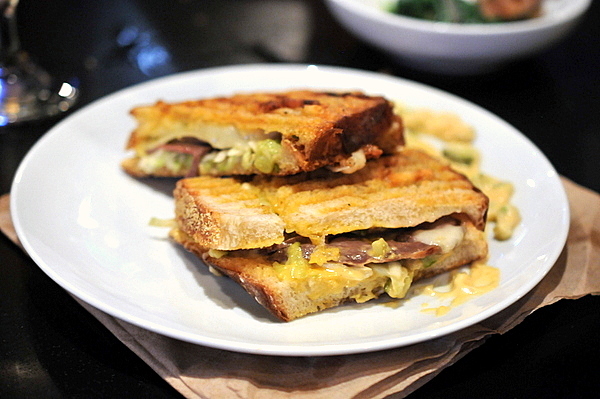 The sandwich was everything one would expect, tender well seasoned meat, tangy sauce (housemade of course), plenty of pickled pungency and melted cheese all stuffed between lightly toasted bread. The flavors are faithful to the original and quite satisfying. This dish was a nice change of pace from the heavy meat dishes preceeding and following it. 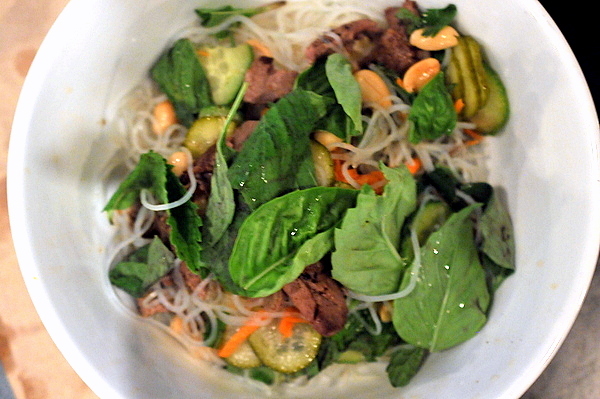 A very faithful Vietnamese bun or noodle salad, the lamb heart plays second fiddle to the robust sauce, the aromatic basil and the delightful snap of the cold vermicelli. The immense slab of IDB Secreto was everything one could want from the most prized cut of the most prized breed of pig. The each bite causes a wickedly porcine oil to gush forth that seems completely at odds with the firm supple texture. 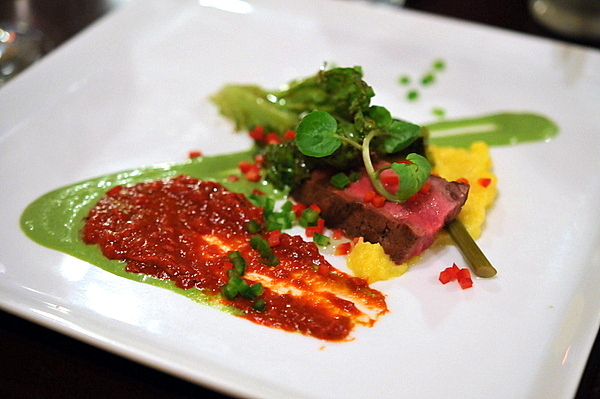 A sauce Romesco compliments the meat with a smoky rusticity. More of those delicious Bleumenthal potatoes dot the plate and while they aren't strictly integral to the dish they do provide a nice sponge for all that oil. A collective groan erupted from our table when we saw this slab of pork. Apparently our serving was par for the course, but they can get even larger. 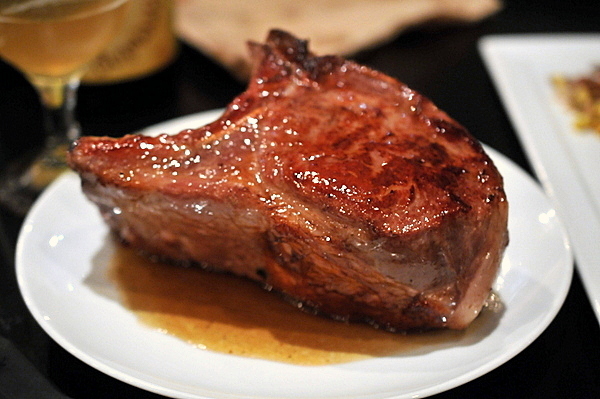 The meat is utterly juicy and tender with a thin ring of fat around the succulent chop. 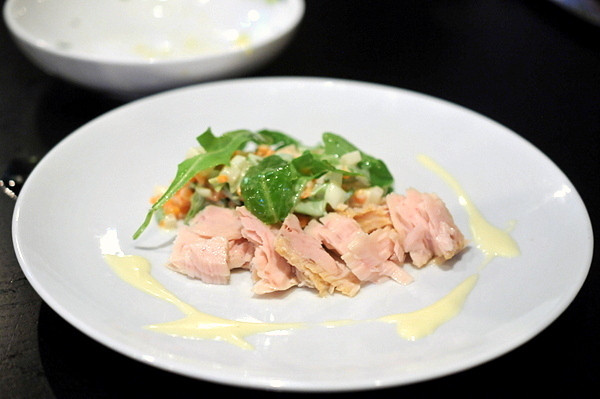 A straightforward but fulfilling dish that any pork lover should try. This was another course that we considered but ended up not ordering. 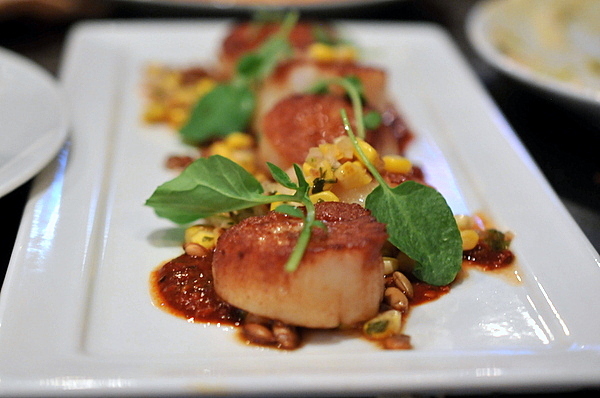 The scallops are faultless beautiful coloring on the exterior with a tender even texture. The earthy spice of the Ranchero felt a bit heavy yet but still paired nicely with the shellfish. By this point I was so full, but this was well worth the extra agony. The meat is absolutely stellar tender and slick with an apparent fattiness from the Wagyu's renowned marbling. The cilantro chili sauce worked wonders, both cutting through all that meaty richness and countering the starchy heft of the fries. 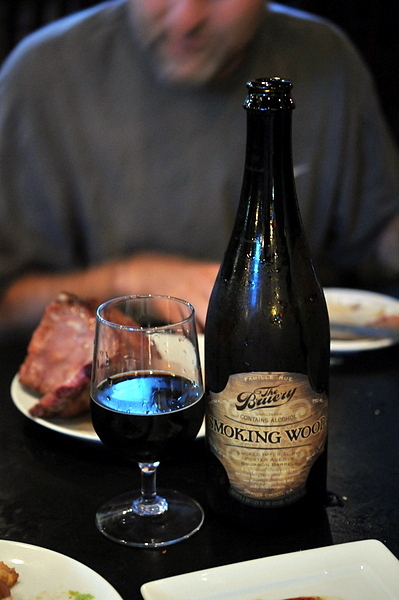 Bruery BA Smoking Wood Mikkeller Sorachi Ace Haandbryggeriet Sweet & Sour Our server Ryan recommended the smoking wood to pair with our final savories, but the smoked beer aged in rye barrels had enough sweet and chocolate notes to pair with the desserts as well. 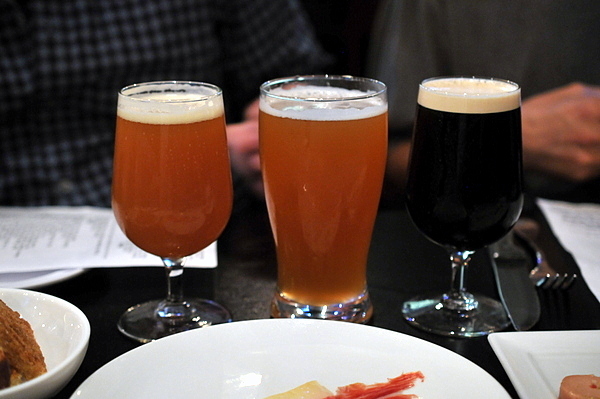 After the savories were cleared from the table, Chef Quinn brought by an armload of beers. 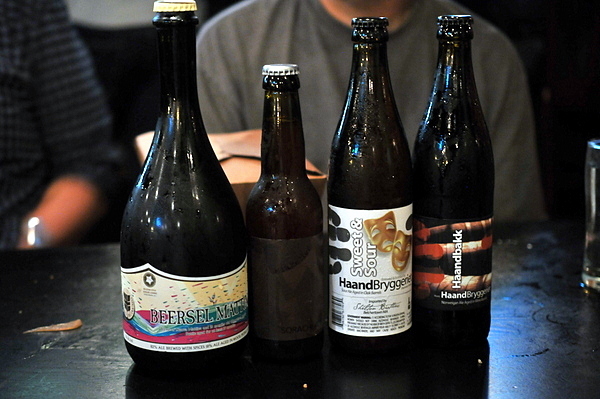 We ended up trying the Sorachi Ace and a sour ale brewed in Norway. The former was a single hop IPA that exuded overwhelming aromas of herbal hops befitting its single hop nature. The sour ale had a musky nose interlaced with fruit and a tannic funk on the palate. I thought this was going to be a cheesecake, but it was actually a round of semi-liquid sheep's milk cheese, creamy and pungent the core reminded me of Époisse de Bourgone, my favorite cheese. The jam and pistachios are a nice touch but I preferred to enjoy the cheese in all its stinky glory. 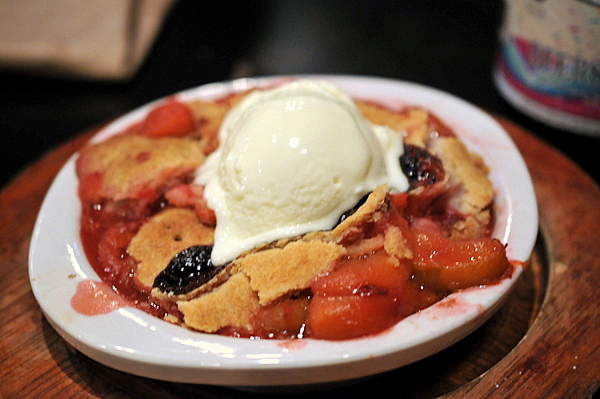 This straightforward dessert delivers exactly what it promises. 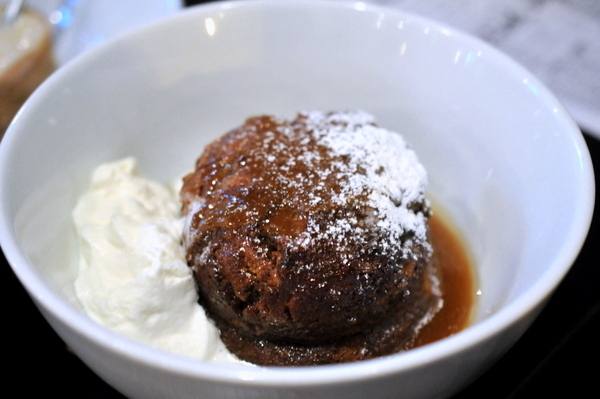 The chewy bread pudding is soaked in a sweet toffee sauce while the bottom has a delightfully sticky texture. Made from hybrid fruits, this exhibits all the candied sweetness and tenderness of ripe fruit. The scoop of ice cream had a denser chewy texture reminiscent of caramel. 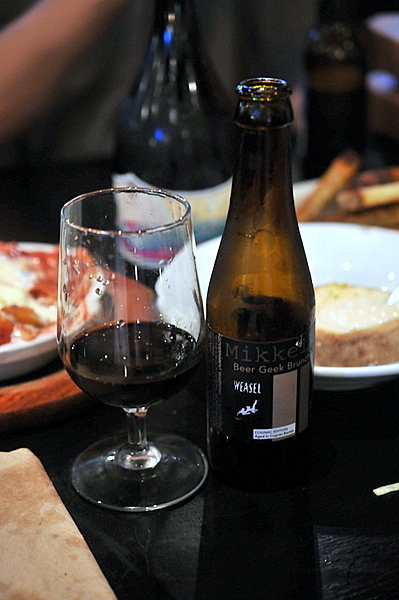 Mikkeller Beer Geek Cognac Deschutes Brewery The Abyss Though we finished dinner we decided to keep ordering beer as various members of the staff came by to chat with us. First up was a special edition Mikkeller's Beer Geek Brunch, made with Civet coffee, the brew is then aged in congnac casks. The rich notes of coffee and chocolate are complimented by an oaky weight with subtle notes of dark ripe fruit. 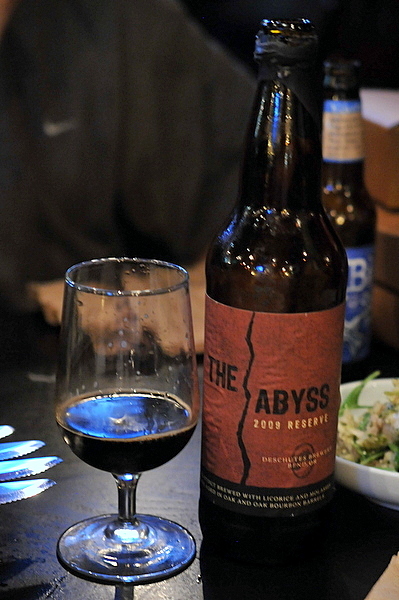 The second beer, The Abyss, was a gift from Jason Quinn's brother, Brandon. The vintage Imperial Stout has loads of coffee, rich malt, and caramelized sweetness with a nuanced tinge of black licorice. We wanted to try this course but somehow it never arrived so we decided to go back. The albacore belly is surprisingly lean with a light fishiness. 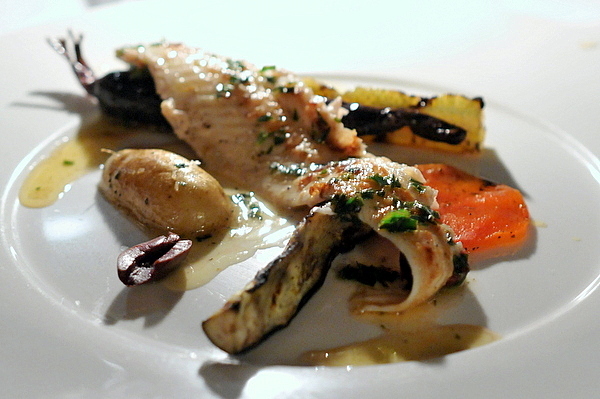 The bitter vegetables and piquant dressing provide a contrasting levity to the fish. An interesting course but one that I was too full to enjoy properly. The kitchen staff took this opportunity to send us more food that we didn't need. 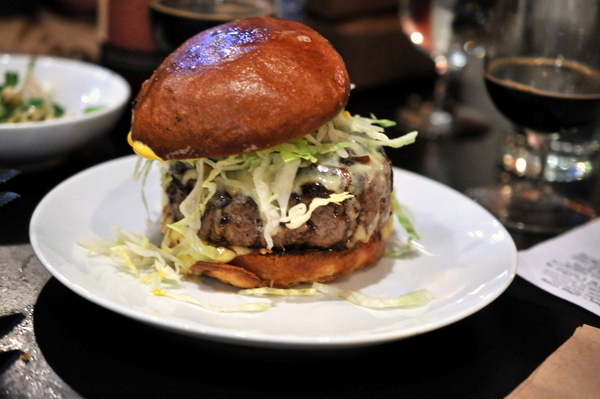 The burger is an absolute beast, the thick patty is served rare with a mild cheese, sweet caramelized onion and a light tangy mustard making it easy to appreciate the burger's rich bovine sapor. 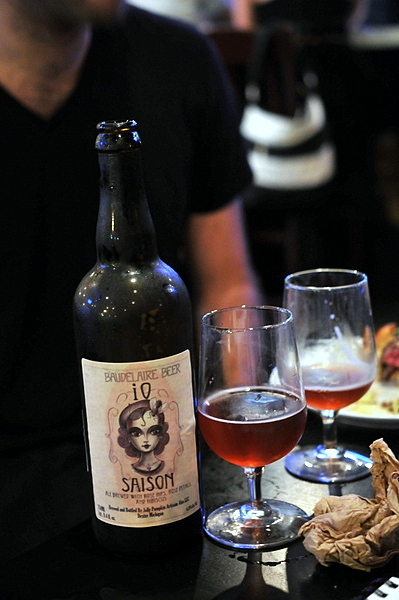 Jolly Pumpkin iO Saison Our last wine was another saison brewed with rose hips. The color was fittingly pink with loads of soft rose notes on the nose and palate. A little bit of citrus and tart fruit round out the flavors, almost more like a wine than a beer. The playground certainly lives up to its name. 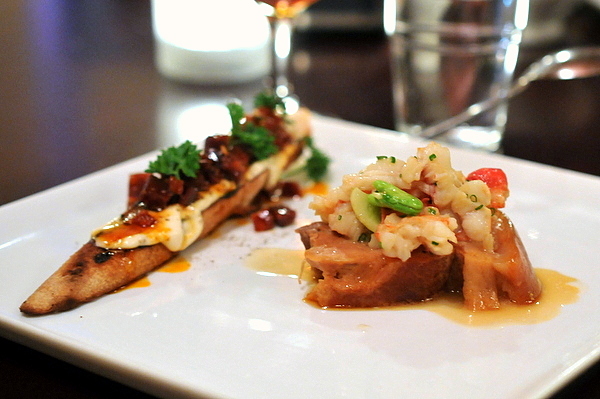 The food is creative and whimsical, befitting the youthful exuberance of its staff. The culinary team clearly loves what they do and it shows in the food they produce. The intense attention to detail and relentless pursuit of the freshest products coupled with talent and passion result in food that is not only fun but delicious as well. I suspect Jason et al would do well in Los Angeles, despite its glut of gastropubs, but in Orange County there is absolutely nothing else like it.